14 Free Patterns For A Rainy Day | Top Crochet Patterns ! Don’t let the pit pit patter of the raindrops dull your day! We’ve rounded up lots of interesting crochet patterns that will inspire you and keep idle hands busy. Choose from accessories to revamp your look, cute toys and adornments little ones will adore, and even homewares to dot around the house. Celebrate the beauty of nature’s food with cute, fruity brooches by Emma Varnam. Consisting of a watermelon and a cherry pattern, they’ll be the perfect add-on to complete your look for a fun day out, and bright enough to get heads turning. If you’re feeling a bit more adventurous, we suggest making other fruits too, to create a lovely cocktail selection. This adorable lacy number is the only accessory you’ll need to stash your essentials. The bag features a classic, Irish design and has a central rose surrounded by an openwork mesh pattern. It’s fancy enough to carry around at a wedding, and casual enough for a brunch date with friends. Heather Gibbs’ fancy crocheted feline will make a great gift for a loved one. Dressed in her favourite frilly tutu and adorable ballet slippers, this colourful dancing cat loves nothing more than practising her pirouettes. 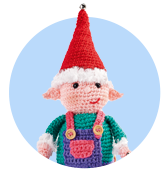 She’s the perfect project for beginners and seasoned crocheters alike. Use pink and red DK yarn for this pre-historic make to make. Ethel the dinosaur is sure to delight any little one who has dreams of becoming a paleontologist. Be sure you leave long tails for sewing up and, most importantly, have a ‘roaring’ good time when making her! Embrace seaside living by making this sweet hat and tug boat set. They are both simple to construct, but do ensure that you sew on the portholes and lifebuoy really securely to withstand stormy seas. 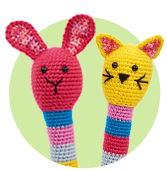 Sarah Shrimpton’s easy-to-make rattle projects are colourful and adorable! Your toddler will spend their days rattling away, but there’s no need to worry as these projects are sturdy enough to withstand any mishaps. Take flight with Sarah Shrimpton’s colourful crochet hot air balloons. They’re ideal little projects if you’re looking to revamp your home décor to really wow your guests. They’d be particularly wonderful in a baby’s room as a mobile to keep your little one occupied. This crochet granny square featuring a cat is a fun and whimsical little project with tons of personality. The pattern is a great stash buster and can be made up in all manner of colour combinations, which will only add to the kitsch look of your chosen project. A simple lampshade is transformed into an adorable decorative accent with the use of the iconic granny square. It’s a simple project for those who are new to the art of crochet. You’ll be able to light up any room and bring instant beauty to your home décor. Crochet coasters are perfect for adding a touch of personality to your home. If you’re a beginner, this project is an ideal way to get to grips with the craft as it features flat, round pieces. The soft Merino yarn in a range of berry shades is a joy to work with too, so these tea-time treats will be a real pleasure to make. These beautiful crochet bowls are very easy to work up and can be used as handy storage units! No longer will you have to worry about losing your keys or any other tiny essentials that you can’t live without. We love the on-trend oranges, greys and whites used here but for a funky, sixties revival themed twist, why not make a set of blue, white and red bowls to imitate a Mod roundel? Pamper your best friend by making this soft crochet blanket. The granny squares in Karen Wiederhold’s pattern are worked tightly, which is a great way to avoid a pet’s nails getting caught. If you’ve got a slightly larger pet, all you need to do is replicate the squares and keep adding them to the sides to continue with the patchwork effect. Clare Trowbridge’s charming keyring project will enable you to use up your yarn oddments quite quickly. Keep the finished product for yourself or make a handful to give to friends and family. Do ensure that you use the same weight for each fob. Heather Gibbs’ colourful bracelets will make a lovely addition to your jewellery collection. Why not turn then into friendship bracelets and give them as a gift to a loved one? Each bangle varies in style so you can practise a range of techniques, from plaits to picot edging. Enter Toymaker of the Year!